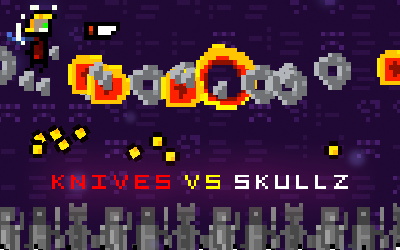 Infinite jump, watch the spikes, throw some knives and blast some skulls. A flappy jam game. Originally inspired by Castlevania - the hero is actually supposed to be based off of simon belmont - but things got crazy - and now you have this game. The game is a hacked/re-tooled version of my work in progress "Mino-Tower". Mac only right now - Coming soon to iOS. Just download, unzip and open. You should just be able to unzip and double click it in osx mavericks.